Rippled Lace Rectangular Shawl is an original PlanetJune Accessories crochet pattern by June Gilbank. Two harmonising shades of yarn undulate together to create a beautiful gossamer-fine shawl with airy lightness and amazing drape. The lace pattern has a 2-row repeat, so you’ll pick it up in no time and be able to enjoy crocheting without having to worry about a complicated pattern. The clever stitch pattern is worked continuously from 2 balls of yarn; there's no fastening off between stripes, or lengths of stranded yarn to worry about hiding. You can even omit the edging and the shawl will still look good! Size: Finished shawl measures 65” x 11” unblocked; 67.5” x 15.5” blocked. 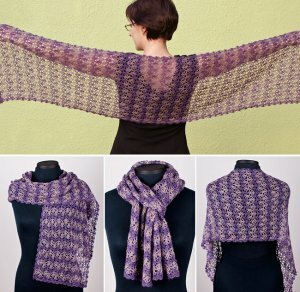 Pattern includes instructions for resizing the length and width of the shawl. Date Added: 09/02/2016 by Nuria Á.